A new study says the more-severe climate model predictions could be the most accurate. 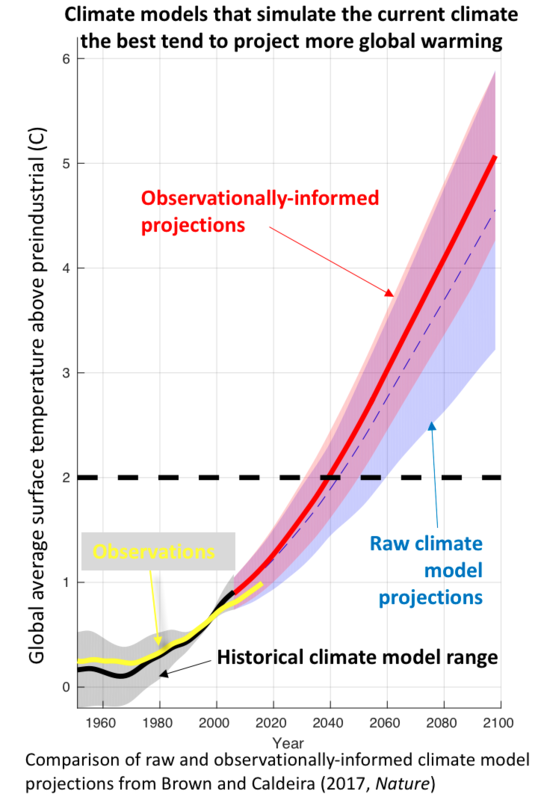 A new paper in Nature states that climate models that lean towards a higher level of global warming in coming years align the best with observations of today’s conditions. As a result, the models currently being employed by the Intergovernmental Panel on Climate Change might have underestimated future warming trends, and what’s to come for all of us. Various organizations around the world create models that can be used to make climate change forecasts. They use these models to run standardized experiments, producing a data inventory that the IPCC can cite in its report. The IPCC panel isn’t actually producing these models itself; it’s simply surveying literature based on work done independently, all over the world. “That’s really what we’re kind of exploiting in the study, these natural differences that arise from people making different decisions on how to best model aspects of the climate system that are hard to model,” said Patrick Brown, a climate scientist at the Carnegie Institute for Global Ecology and co-author of the Nature paper, to Futurism. Brown gave the example of clouds, as there’s still some debate on how they might respond to global warming. The remaining uncertainty leads to different modeling groups making distinct choices with regards to projected cloud behavior. Brown and co-author Ken Caldeira worked under the assumption that the models that were best at simulating the recent past would be best at projecting the future. Using those models, their research suggested that warming will likely be around 0.9 degrees Fahrenheit greater that the data in the raw model suggests. Brown notes that the IPCC has done a good job on its report – the intention of his work with Caldeira is simply to show how improvements could be made. He added that the IPCC’s baseline position is to give each submitted model roughly even standing. Every single model is essentially averaged together, without any distinction between what the panel considers to be a good or bad attempt, in an effort to avoid controversy or allegations of discrimination. Brown and Caldeira’s paper is meant to argue what makes a good model. “We wouldn’t expect the IPCC to just completely abandon what they’ve been doing before,” said Brown, before stating a hope that the panel might cite their attempts to demonstrate how some models might outperform others.